A virtual reality system which allows children to manipulate planets or watch flowers spring to life has become a big hit in Singapore primary schools. A system being trialled in the South-east Asian city state, called "mixed reality", displays graphics as three-dimensional images in the classroom. 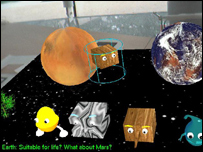 The child wears a small headset which allows them to see moving, interactive images of the Solar system or plants as if they were in front of their eyes, but, instead of having an entire world generated inside a big helmet, the images appear as if they are in the class with the other children. "The mixed reality classroom is a combination of our mixed reality technology with educational theory," Wei Liu, of the Mixed Reality Lab which developed the system, told the BBC at the Digital Interactive Media in Entertainment and Arts conference in Perth, Australia. The system works through boards laid out on a desk. When a user looks at the board through their head-mounted display, the headset registers the board and displays objects. 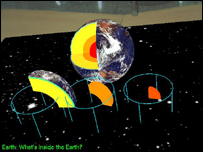 With the solar system, they can see planets and move them into the correct order, or "dissect" the Earth to see what is inside. 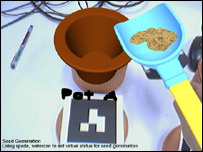 Meanwhile the virtual plants can germinate, to allow students to observe how they reproduce - complete with virtual bees. The display also includes a camera so other students can view what the user is seeing on a big screen. Ms Wei said that child feedback on the mixed reality system had been very positive. "They say, 'this is interesting' 'the graphics are attractive', 'I like this topic,' 'I want my school to have this system'," she said. "We have noticed that in Singapore, they have a lot of I- related stuff in primary schools, and students use it a lot. "They accept the combination of the physical world with the virtual one." She explained that in order to test the effectiveness of the tool, teachers split their classes into some children who used the system, and others who were taught using traditional learning methods such as lectures and online information. After the school term the children were tested, and the ones who had used the mixed reality did better. Ms Wei admitted, however, that setting the system up was expensive. But she added that the main cost was development of the system, the software and modelling - and that after that costs were lower. "After the system is built up, the costs are quite low; you just need a general computer with a good graphics card," she said. "If we can expand this system to a lot of primary schools in Singapore, the costs will go lower."